The name Nathan MacKinnon has become a familiar one for hockey prospectors. One of the game's best players, scouts have been praising his play for years. His time to join the NHL ranks is near. But collectors don't have to wait for Nathan MacKinnon hockey cards. The first overall pick in the 2013 NHL Draft has several cards available now, thanks in large part to In the Game's prospect-driven releases of the past couple of years. Shop for Nathan MacKinnon cards on eBay. MacKinnon has the potential to be one of the game's offensive greats. He's tremendously fast on his skates and is exceptional at moving the puck around. For opposing teams, that means MacKinnon is a major threat to score himself or draw the defense's attention and pass to a teammate. 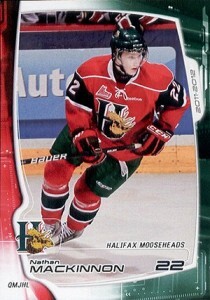 In 2011-12, is first with the Halifax Mooseheads of the QMJHL, MacKinnon scored 31 goals to go with 47 assists in 58 games. Limited to just 44 games in 2012-13, the super prospect still managed to get 32 goals and 43 assists. 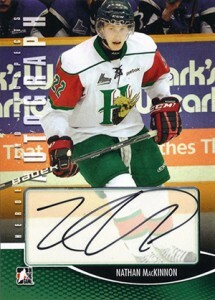 MacKinnon proceeded to lead the Mooseheads to a Memorial Cup Championship, notching a hat trick in the tournament's deciding game. The first Nathan MacKinnon cards came out in 2011-12. However, ITG made him an even bigger part of their 2012-13 products. Here's a look at some of the key Nathan MacKinnon cards available ahead of his official NHL rookie cards. Over time, team-issued cards can become difficult to find. The 2011-12 Halifax Mooseheads Nathan MacKinnon already is, relatively speaking. Aimed at local crowds more than card collectors, few make their way to the secondary market. Usually there aren't a ton to begin with. 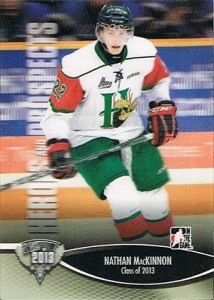 This Nathan MacKinnon card is part of a team set available originally to Mooseheads fans. 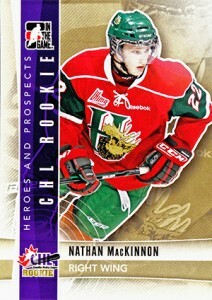 The first pack-inserted Nathan MacKinnon card is from 2011-12 In the Game Heroes & Prospects. Without any NHL rookie cards to compete with yet, it carries solid values. Interest may wain a little once he makes the jump, but this fully licensed CHL carry will always carry a lot of significance. Like his base card in this set, the 2011-13 ITG Heroes & Prospects Nathan MacKinnon autograph is important for being a first. In this instance, it's his first certified autograph card. While it uses a sticker, you would hardly know with the clear labels and tight positioning that ITG uses. Second-year cards usually don't carry a lot of clout. Second-year minor league cards? Normally, the collective response would be one of, "Meh," even for someone like Nathan MacKinnon. 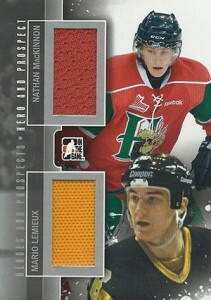 However, the 2012-13 ITG Heroes & Prospects Nathan MacKinnon is not your regular card. It's part of a 3D subset that takes the technology to a new level in the hobby. The fact that the subset is short printed certainly helps values also. It's a somewhat readily available autograph. What more needs to be said? Although, it is worth noting that the card is a confirmed short print among the product's autograph inserts. Limited to 40 copies, the 2012-13 ITG Heroes & Prospect Jersey and Auto Nathan MacKinnon has a clean design that highlights both centerpieces. The swatch size is big compared with a lot of other memorabilia cards. The Gold version of the card is limited to ten copies. It takes a lot for a basic jersey card to drum up a lot of interest these days, especially when they feature modern players. But there's something about the pairing of MacKinnon and Mario Lemieux that is very appealing. The 2012-13 ITG Heroes & Prospects Hero and Prospect dual jersey card is limited to 40 copies and is relatively affordable on the occasions that it pops up. 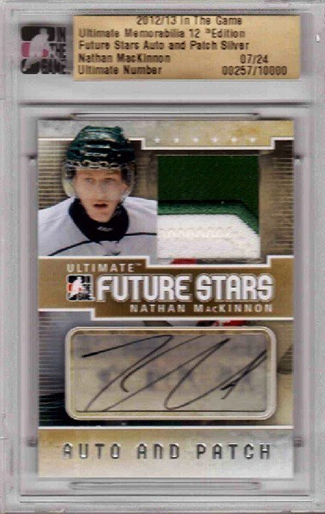 The 2012-13 ITG Ultimate Memorabilia Future Stars Auto and Patch Nathan MacKinnon is by no means cheap. But it's on par with his more plentiful basic autographs found in Heroes & Prospects. The inclusion of a patch, high-end appeal and low print run of 24 copies make it a bit of a sleeper when it comes to early Nathan MacKinnon hockey cards. 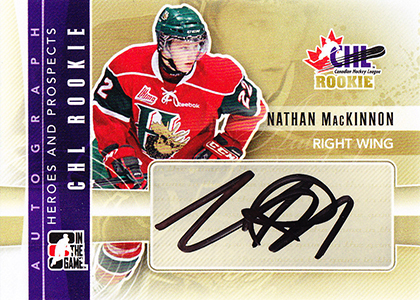 Nathan MacKinnon has a pair of autographs in 2013 ITG Draft Prospects. The major selling point for each is the on-card signature. Both are confirmed as short prints by ITG.